Hutchinson , a city of around 41,000, was founded in 1872. Salt was discovered in Reno County in 1867 and Hutchinson built its reputation on salt mines. Salt is still mined here, and the underground mines are also used for safe, climate-controled archiving of nationally important documents and artifacts, including classic Hollywood films. There is a state prison in Hutchinson. A chief tourist attraction is the Kansas Cosmosphere and Space Center. Nationally revered Kansas poet William Stafford is a native of Hutchinson. Scott Heim II, whose novel Mysterious Skin was filmed in 2004, is also a native. 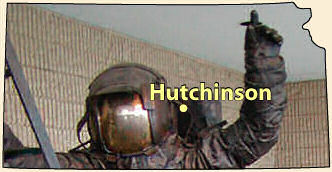 Steven Hind, Kansas poet of the Flint Hills, is retired from teaching English at Hutchinson Community College and makes his home in Hutchinson. William Sheldon now teaches creative writing at HCC. Tyler Sheldon, William Sheldon's son, is the author of First Breaths of Arrival.